Russian airspace is guarded by a unique aircraft, which can intercept any target, from hidden cruise missiles to satellites – day and night, rain or shine, and at any speed. Defence analysts believe that no other aircraft of its kind would be able to compete with the Russian MiG-31 in the next 10 to 15 years. The two-seat supersonic fighter-interceptor, referred to as Foxhound by NATO, is the first Soviet combat aircraft of the fourth generation. In the late 1960s, there were two reasons to build this aircraft, internal and external. On the one hand, the US put strategic cruise missiles and the FB-111 bomber into service. These could fly over the North Pole and reach boundaries of the USSR at low altitudes, following the relief and avoiding coming into sight of our satellites. On the other hand, there was a gap in the radar barrier in the North of Russia. In order to fill this gap and to meet any ‘uninvited guests,’ Moscow decided to launch an aircraft capable of monitoring air space over a wide front and altitude range. These aircraft were the new MiGs, built in the Artem Mikoyan Experimental Design Office (today the Russian Aircraft Corporation MiG). After their assignment to combat duty, American reconnaissance aircraft started to fly less frequently across the boundaries of the USSR. Now, when the issue of protecting Russian interests in the Arctic region has become increasingly important, the MiG-31 “Arctic” experience can be of great service to the northern formations of the Russian Army. The MiG-31 is capable of intercepting and destroying any target from low-flying satellites to cruise missiles. A group of interceptors can control a large portion of air space, by directing fighters to any target, as well as ground-based anti-aircraft missiles. This aircraft was called the “flying radar” by the pilots, for its unique avionics capabilities. This complex has at its basis the ‘Barrier’ control system, equipped with the world’s first phased-array antenna. This PAA differs from the classic radar as it allows to move the beam at a fixed antenna, as well as to create the necessary number of rays, tracking multiple targets simultaneously. The Barrier is able to detect 24 objects at a distance of 200 kilometres. The on-board computer chooses the four most dangerous targets and directs long-range air-to-air missiles at them. The other four targets (the maximum number of simultaneous targets that can be attacked is eight) are destroyed either by the medium-range and short-range missiles or their coordinates are transmitted to fighters and anti-aircraft missiles on the ground. Experts say that in the next 10 to 15 years there will be no aviation system built that can match the MiG-31. All modern fighters (except for the fifth generation fighter aircraft) are not fully supersonic, since their supersonic flight time is limited to 5–15 minutes, due to various kinds of restrictions in the airframe design. 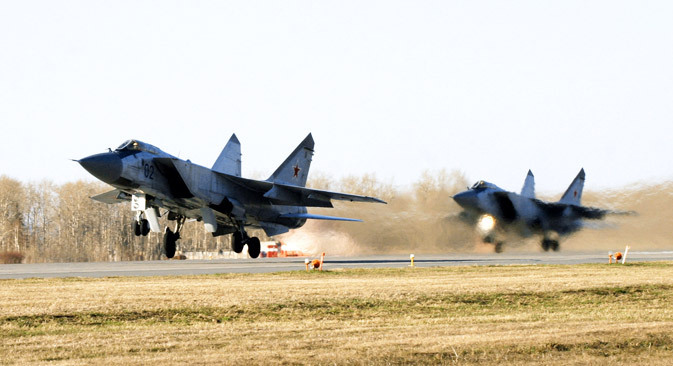 Duration of the MiG-31 supersonic flight is only limited by the fuel supply. Moreover, the MiG-31 is able to pass the sound barrier in level flight and in climb mode, while the majority of supersonic aircraft pass the M=1 speed in a shallow dive. Production of the MiG-31 began in 1981 at the Sokol plant in Gorky (now Nizhny Novgorod). By the end of 1994, more than 500 of these machines were built, and then their production was curtailed. Today about one hundred of these are operational. The modernization of the MiG-31, launched in 1984, led to the creation of the MiG-31M. This is considered the best invention and creation in Soviet military aviation history, with some information about it still being considered confidential today. It is known that the MiG-31M, at the maximum speed, is faster than any similar aircraft in the world, by at least 500 kilometres per hour. In August 1995, the aircraft was shown at the MAKS-95 Air Show in Zhukovsky and caused a sensation. However, the MiG-31M did not go into serial production. Nevertheless, at the Sokol plant and at aircraft repair plants, the production capacity, staffing and documentation necessary for the resumption of work still exist. Aviation professionals believe all these factors will reduce production costs for the restoration of so promising an aircraft by a third.